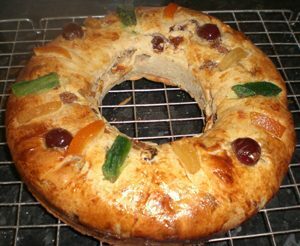 This is a traditional Portuguese crown-style cake for Epiphany, to celebrate the arrival of the Three Kings on 6 January. Soak the sultanas in alcohol till plumped up – ideally about an hour or so. Meanwhile, start on the dough. Mix 100g of the flour with the yeast and water; leave to stand for about 30 mins till frothed up a little. Beat sugar and butter, then add eggs and remaining flour and zest, then the flour/yeast/water mix. Knead thoroughly for about 10 mins, preferably in a Kitchen Aid or equivalent (gets very sticky). Add soaked sultanas plus any liquid that hasn’t been absorbed by soaking; mix well to make sure sultanas are fairly evenly distributed. Cover with clingfilm and leave to rise till about doubled in volume – up to 4 hours. It’s fine to leave it to rise slowly in a cool kitchen overnight, which is what I usually do, and then bake it fresh in the morning. When you’re ready to bake, preheat oven to 180° C, gas mark 4. Grease a baking sheet. With floured hands, shape your dough into a ring approx 24cm (9”) diameter and put it on the baking sheet. To make sure the ring doesn’t close up, I put a 10cm round metal (ovenproof) cookie cutter in the middle, greased. Brush the cake with beaten egg, then decorate with glace fruits. Bake at 180° C for 15 mins, then remove the cookie cutter (the dough won’t expand any more now) and reduce the heat to 160° C (150° C for fan oven). Bake for another 15 mins or so till golden. Leave to cool before cutting. Traditionally you should include a little china trinket such as a king, wrapped in greaseproof paper, and a dried broad bean. The person who gets the trinket is cheered; the one who gets the bean pays for next year’s Bolo Rei!